Welcome to the website for the North Olympic Peninsula chapter of the Puget Sound Anglers. We are dedicated to preserving quality fisheries. We believe that our fisheries resources can be restored to what they should be with sound science and appropriate management techniques. Our fishing club is privileged to have the support of many fine sponsors. They help us achieve our club goals with their financial support and contributions. We meet monthly, the 3rd Thursday, to share fishing information and to hear from professional biologists, guides and local experts on topics pertinent to the Olympic Peninsula. Our meeting place is: Trinity Methodist Church 100 S. Blake Ave. in Sequim from 6:30-8pm. 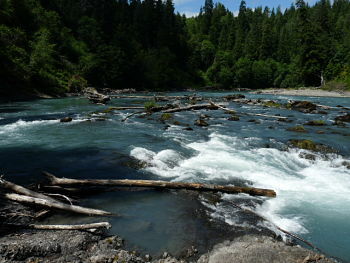 Recent topics have included: the Elwha dam removal, techniques for fishing for halibut and Bottomfish/Rockfish identification. We have a members only raffle at each meeting ($1.00 tickets) for fishing gear like lures, tools and rods. It's a great way to add to your tackle box and as everyone knows, "you can never have too much tackle".